YES! GroundSchool features ACTUAL QUESTIONS (current for 2019 and continuously updated) that you will see when you go to take your FAA written exam and is fully compatible with and will be regularly updated for changes to the evolving FAA Airman Certification Standards (ACS). Learn more about how our GroundSchool programs and apps feature superior learning content that leads to better study, testing, and learning outcomes. We work continuously to ensure that the content is as up to date as possible. Have questions about this software? Please Contact us via our helpdesk. Remember - the Instrument Flight and Ground Instructor Written Tests are similar to the the initial IFR tests. 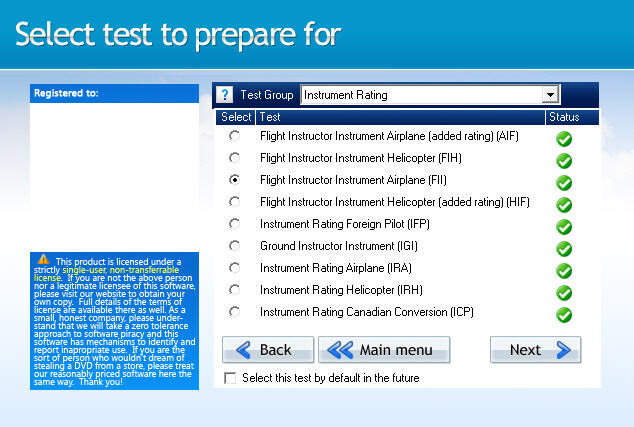 Therefore, they are in the IFR version of the GroundSchool Software, NOT the CFI version! With a minimum of time and cost, YOU can ACE your FAA Flight Instructor Instrument (FII, aka CFII) or Instrument Ground Instructor (IGI) knowledge (written) test using our GroundSchool Software. 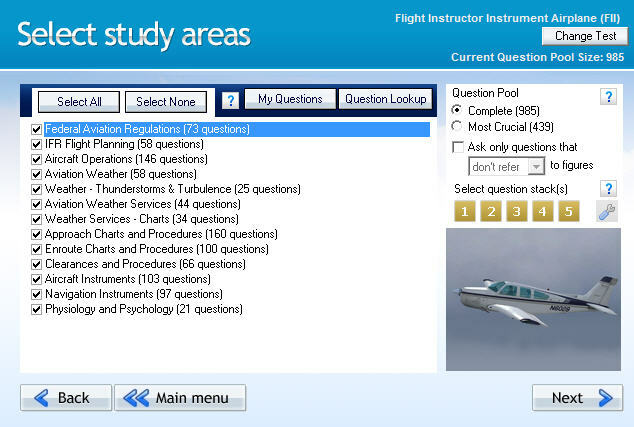 GroundSchool features up-to-date, ACTUAL FAA QUESTIONS. Answers and Explanations have been written by highly experienced flight instructors and professional pilots. All required charts and figures are included. 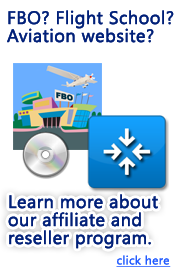 By this point, you're familiar with the format of FAA Knowledge tests and you probably appreciate the benefit of getting them done sooner rather than later. Our software helps you do this is a no-nonsense fashion. This software costs about the same books do, but is significantly more time efficient. Sure, DVD/Video sets may look pretty, but most find them inefficient, timewise. Our software works on YOUR pace at significantly lesser cost. GroundSchool can be used to prepare for the Instrument Flight Instructor and Instrument Ground Instructor tests as well as for all initial instrument rating tests (airplane and helicopter). Download / Get the Apps! The links below are for the 2019 versions of our award-winning FAA test prep software and apps. They're updated regularly throughout the year to be as fresh as possible. If you're not ready to take your test just yet, we've got you covered; all of our GroundSchool apps feature free lifetime updates for both the question banks and the apps themselves. Why are are downloads so large? - A slightly longer download yes, but a much better product. Click here to find out why. This single large download includes all of our FAA knowledge test prep titles - Private through FE/ATP + Mechanic [More Info]. In MP3 format for your iPod™ / music player or to burn to CD and listen to in the car and elsewhere. Having difficulty? Please let us know - we're here to help! Click here for help with downloading / installing more than one test bank (or a "bundle") at a time. We believe (and scientific study validates) that the interactive activity of test preparation, when combined with the sort of detailed supplementary and explanatory material that we offer, is an excellent way to thoroughly learn and internalize key aviation information. We are test prep specialists and the experience of thousands upon thousands of pilots proves that our method works. We do not use test prep as a "hook", as some of our advertising-based competitors do, to sell you expensive but ineffective passive video-based courses and similar products that do little besides waste your time and drain your wallet. Use our material and study hard - not just the questions and answers, but the reasoning and explanations too, and be on your way, in a highly time and cost efficient way, to knowledge test and aviation success! 70000+ IFR Approach Plates - $39.99! Are you an IFR student / refresher pilot who uses a PC flight simulator (like MS Flight Simulator or Elite) to help you train? If so, have a look at SimPlates X ULTRA - 70,000+ approach plates freely-downloadable from the application. Includes 99.9%+ of USA approach plates! Connect with your instructor / CFI! This software has a really cool feature. After you complete a study session, you can, choose to report your progress to our TestPrepStatus.com system where you will be able to see charts of your study progress so that you can identity your weak points. The really cool thing, however, is that you can also invite your instructor (CFI, flight school, mechanic school, mentor, parent, study partner, etc) to log in and monitor your progress. This is neat because now you can prove to your instructor in a concrete way now your study is progressing. Access to the TestPrepStatus.com system is completely free for you and your instructor! Only GroundSchool has this innovative system. GroundSchool is designed to help you learn the material and score highly on your test in the most efficient manner possible. Our software represents years of listening to and understanding the needs of pilots and mechanics. The program is designed with the singular goal of helping you learn the material so you can pass your FAA written test with a minimum of time and effort. Sure, there are some study methods that are cheaper (and many far more expensive!).. but only if your time is worth nothing.. Our software is fast, efficient, and proven. With our FAA Written Test Prep software, you don't have to worry about having an out of date version. Our authors work to update the data as FAA question pools change. Groundschool has a built-in self-update feature that connects to our servers and makes sure that you have the latest and greatest versions of the software and data soon after they becomes available. Additionally, the self-update can be used to install new test data (such as Instrument Rating on top of Private Pilot) so you can have it when and where you need it. "I Passed the IFR (Airplane) and Flight Instructor Instruments tests in the same afternoon after using your apps! I think your apps are very good. There was a guy next to me at the CATS testing center that failed after using She**** A**. ... I think the intuitiveness of your apps is superb. ... Thanks for the help, I'll be using this for my commercial as well! " - JT - GroundSchool User. 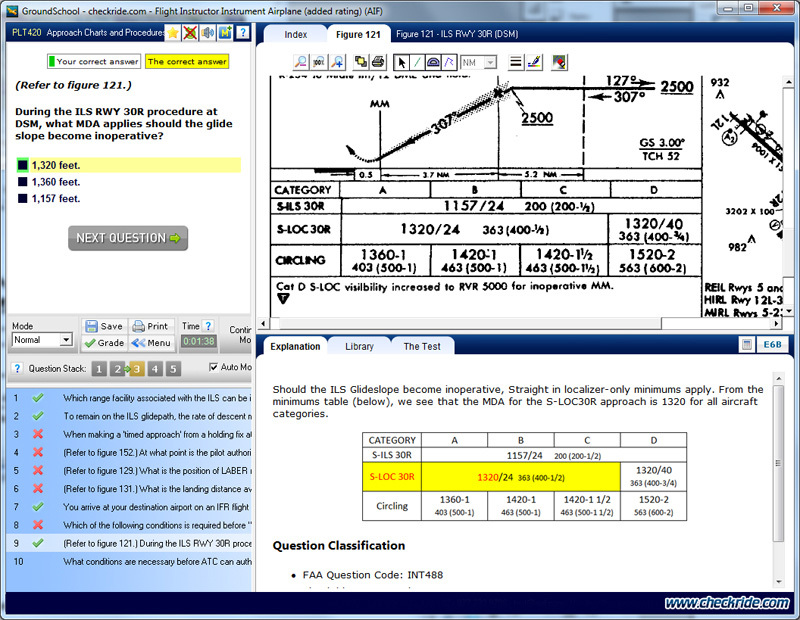 "I wanted to express my gratitude for the FAA Ground School Test Prep Software. The features are outstanding with regard to knowledge reinforcement, cross referencing, concentrating on weak points, and ease of use. Even if you have one of the other home study courses you still need this program." - DM - GroundSchool User. "I took my test yesterday, and scored 97%. I hd K***'s DVD set and an A** book too. None of them hit the mark in terms of meeting my needs as much as your app did. I was able to load the app on my work laptop, and take practice tests everywhere: in airports, in-flight (in scheduled airlines), long meetings. It really helped that I could save my tests, and could review the questions I got wrong later. Being able to search for questions ... was very valuable in keeping me efficient and focused. You should all be proud of having created something so useful, so well thought out! " Unlimited use of the program to help you prepare for for tests in any one of the above pilot, A&P, or drone test banks. For the Professional Pilot of the future! One of our best Value FAA written test prep packages. This is for those really focused on a career in aviation. This package includes both the Takeoff and FlightLevel Bundles combined. For the Professional Pilot of the future who also wants to operate in the dynamic Sport Pilot world! Our Best Value FAA written test prep package. This is for those really focused on a career in aviation but who also love it enough and want the 'future proofing' security of also getting a Sport Pilot license(s). This package everything from the Takeoff, Sport Pilot, and FlightLevel Bundles combined. Complete preparation for the three written / knowledge tests (General, Airframe, and Powerplant) that you'll need to take and pass to get get an FAA A&P certificate. Includes access to all three A&P test banks. Please note: choosing this is the same as choosing a "pick 3" bundle above and then selecting the mechanic tests from there. This is for purchasing the Military Competence test banks (Military Competence Airplane and Helicopter - MCA and MCH and/or Military Competence Instructor (MCI)) only. Purchase this option if you are a military pilot wishing to obtain your FAA civilian commercial pilot and/or flight instructor certificate(s) on the basis of your military experience. See the Military Competence page for full details. This is for purchasing the prep for the Fundamentals of Instruction (FOI) test only. This is for people who are sure that they need ONLY the FOI prep. Most flight and ground instructor candidates should NOT get this, but rather the complete CFI test bank that includes all the flight/ground instructor tests plus the FOI. To be clear: any purchase that includes automatically includes at no extra charge, so that if you selected as a title either as a 'single test bank' or part of the pick 3 bundle, you'd get both CFI and FOI and it would only count as one test bank. This "FOI only" option here is at a lower price for those who know that they will only ever need FOI. "Hey Guys, I just wanted to let you know that I took my Flight Instructor Instrument (FII) written today and got a 96%. I am a 95' Embry Riddle Grad and got my single multi engine Private Instrument back in the early 90's and decided to complete my CFI, CFII and MEI ratings. Your software really helped me break some of the rust off and get back in the pilot seat as far as the knowledge tests. Money well spent!!" - Sincerely, CM, CEO ***** Aeronautics, Inc.
"I have been telling the students that come to me for instrument training that the written must be completed before we start training, and I always suggest your stuff." - Bill Zaleski, gold seal flight instructor with 10,000+ hours and holder of four ATP and three commercial ratings. Formerly of Professional Instrument Courses, inc. (11 years), Bill now takes on students for individualized concentrated IFR training. See instrumentratings.com for more details. The feedback keeps rolling in. Our users routinely score very highly on their knowledge tests. We invite you to be next. It's hard to say for sure, but we're confident within reasonable doubt that we have helped "hundreds get hundreds" with our software by this point. Plenty of study and testing options allowing you to personalize the software for your own most efficient study. You can get an instructor signoff to take the actual written test through use of this software and our Online Endorsement Service. LaserGrade, CATS, and AvTest 2000 Emulation modes allow you to practice on the software as you will see it at the actual testing center. Printouts galore! Print out score reports to show your instructor, a "book" of questions for yourself to study on the road or elsewhere. Something that is not really quantifiable or visible: fast, efficient study. The software has been designed to be quick so your time is spent preparing and learning, not flipping pages or clicking about needlessly. * This list refers to features found in the MS-Windows™ PC versions of GroundSchool. We continually work to upgrade both the content and functionality of our software and apps. Upgrades are always available free of charge and with minimum hassle, usually through straighforward, built-in self-update features. Our products can help you not just pass your test now, but will also be there for you when you want to review and update your knowledge down the line. This is one of many timesaving, score-boosting, and stress-relieving features unique to GroundSchool. The Advanced and Basic Ground Instructor tests use (essentially) the same questions as the FIA Flight Instructor Airplane test. Therefore, if you're studying for the FIA (or Flight Instructor Instrument Airplane), it's not a bad idea to take the AGI or BGI (or IGI) test immediately (as in 5 minutes) after taking your FIA (or IFI) tests. Yes, this will cost you an additional testing center fee, but you'll get the ground instructor ratings with zero extra study time. While the ground instructor ratings may be somewhat needless for most flight instructors in terms of instructing, they do look good on an aviation CV plus they are required if you ever get the opportunity to upgrade your flight instructor certificate to Gold Seal status. Elite is the most advanced IFR flight simulator available for the personal computer. Check it out at www.FlyElite.com. This is not a paid advertisement - just some heartfelt helpful advice from the CFIIs at www.faatest.com.